This model SBRSL-400 is India’s first, high speed rotary sticker labeling machine. The equipment used for labelling ampoules is known as Ampoule Labelling Machine and vial labelling machine is used for labeling vials, include the most modern micro processor based label dispensing system and a user friendly sensing system for products and labels. It is utilized for labeling round shaped ampoules, vials, and other such objects. Hence it is also known as ampoule labeling machine and vial labeling machine. Further, this super speed equipment has the capacity to rapidly label up to 400 products in just one minute, based on the size of product and label. The rotary labeling machine even incorporates an exclusively designed mechanical and electronic system to apply transparent or no look labels, on the vials and ampoules at very high speed; and also an optional label sensing system. This high speed rotary sticker labeling machine is a unique model; with the highest installation in India. It even has a distinct synchronized speed control system. The inherent and preset label length detecting system helps you to avoid the manual input and storage of label length data into the memory; and retrieve the same details every time to change the label size and restart the machine. It thus saves time and money, prevents machine downtime, and enables to obtain higher production. 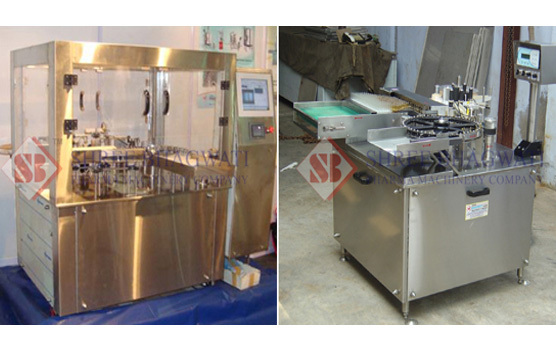 This equipment has a special feeding device to feed the ampoules/vials and collect the labeled products in a vertical position directly from the trays. Hence the operator can feed the ampoules/vials online for labeling without any machine stoppage. As a result it avoids breakage of ampoules and vials; and eliminates the long and difficult way of loading the products for labeling; as compared to the other slant hopper feeding system. This model is also available with an online, linear packing line for ampoules/vials that can be connected directly with the capping machine or turn table for continuous feeding.